Located in the central part of Germany, on the banks of the River Main, Frankfurt is considered the largest financial, transport and cultural center of the country; therefore, many offices of world companies are located in Frankfurt. In this regard, some residents gave the city a nickname – ‘Bankfurt’. Here are some of the most famous and significant universities of the country: University of Applied Sciences, Frankfurt School of Finance and Management, Goethe University and others. Johann Wolfgang von Goethe – philosopher, thinker, naturalist, educator and, most importantly, the great and brilliant German poet was born in Frankfurt am Main on August 28, 1749. His parents were wealthy and respected people: his father was an emperor’s adviser and a lawyer. His mother was a noblewoman, daughter of a Frankfurt elder statesman. Johann began to show striking abilities for science already in his childhood. At the age of seven he knew several languages, besides, at this age, he began to write his first poems and to compose plays. A talented child read a lot and tried to maximize his knowledge. 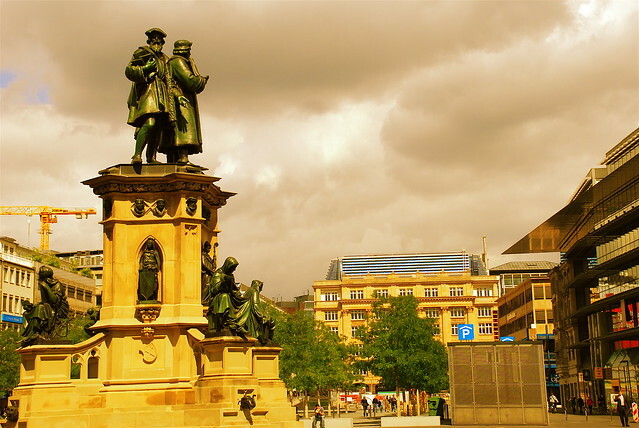 Residents of Frankfurt are proud of the fact that the poet was born here, despite the fact that the name of Goethe is often associated with the city of Weimar, where he lived most of his life. In Frankfurt, much reminds of this outstanding personality. On the northern outskirts of the Frankfurt City Forest in Sachsenhausen-Nord, in 1931, to mark the centenary of the poet’s death, a 43-meter tower was built, which became one of the highest observation points in the city. It was one of the five high-rise wooden buildings in Germany. It was surrounded by a park of 3 hectares. By the end of the First World War, it turned decayed, so it was dismantled. In the spring of 2014, the tower was opened after major repairs. Unfortunately, the tower was burned down in October 2017. Nevertheless, you can still visit the Goethe Museum and the Goethe University with the help of car rental in Frankfurt Airport. In a neat eighteenth-century house, on the quiet Grosser Hirschgraben Street, in 1749, the great German poet Johann Wolfgang von Goethe was born. During the war, the massive bombing of the city razed to the ground not only this house, but also the whole street. Only by the efforts of the restorers, this historical monument was restored in its original form. Now here is the Goethe House Museum (The furnishings and interiors of all rooms were restored according to the Goethe notes and the noted of his family’s acquaintances.) The interior of the premises (valuable paintings, furniture and books) was genuine: it was prudently removed and hidden in a safe place and, fortunately, had a narrow escape. The visitors can admire the living room, which walls are covered with wonderful blue tapestry, and see an oven, decorated with a magnificent bas-relief with the Lady of justice on it. Among the items of the large collection of the poet’s original belongings, the paintings and busts of the 18th and 19th centuries, pieces of furniture and autographs of the great Goethe have perfectly preserved. In the workroom, which is of greatest interest to visitors, a table, at which Goethe worked on manuscripts of his great works, has preserved. The walls of this room are decorated with portraits of the poet himself and Charlotte Buff, who had inspired him to write “The Sorrows of the Young Werther”. In the workroom, the young poet was working on the creation of this cult novel. The first outlines of “Faust” were also made there. Thousands of tourists visit the Goethe Museum to pay a tribute to the work of the greatest poet. The Goethe House Museum is part of Frankfurt’s cultural heritage and the city’s pride, attracting thousands of admirers of the great poet Johann Wolfgang von Goethe. This Frankfurt University is named after Johann Wolfgang von Goethe, who was a famous scientist, born in Frankfurt, known for his outstanding contribution to literature, natural sciences and philosophy. The University traditionally occupies the top lines in international rankings of research universities and it is famous for a wide range of educational programs. The structure of the university includes a whole group of research institutes, and its main feature is an interdisciplinary approach to solving complex problems. Today, the Goethe University is one of the few universities in Germany that receives an impressive amount of funding from the government, having autonomy in management and the right to create its own funds. In 1914, Frankfurt University was founded as a unique “city university”, which activities were financed by wealthy residents of Frankfurt. In 1932, the university received the name of one of the most famous natives of the city – Johann Wolfgang von Goethe. Today, more than 38,000 students study at the university. Talking about the university’s history, we can note that over the last decade there have been many changes in its work, which gave it an additional impulse to move forward. Formerly considered an institution with leftist and liberal views, this University is also known as the birthplace of the famous Frankfurt School, which gave the world many great European thinkers of the 20th century (including Theodor Adorno, Hans-Georg Gadamer, Max Horkheimer, Herbert Marcuse, Paul Tillich, Jurgen Habermas and Martin Buber).